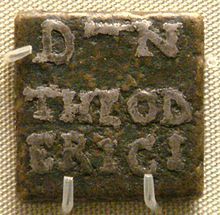 Bronze weight, inlaid with silver, with the name of Theodoric, issued by prefect Catulinus in Rome, 493-526. Theodoric the Great (Stampa:Lang-got; Latin: Flāvius Theodoricus; greqisht: Θευδέριχος, (Thev'ðerichos, θɛvˈðɛrixos); Stampa:Lang-ang; gjermanisht: Theoderich der Große]]; Stampa:Lang-on; 454 – August 30, 526), was king of the Ostrogoths (471-526), ruler of Italy (493–526), regent of the Visigoths (511–526), and a viceroy of the (Eastern) Roman Empire. His Gothic name "Þiuda reiks" translates into "people's king". He became a hero of Germanic legend. Kjo faqe është redaktuar për herë te fundit më 27 gusht 2016, në orën 01:51.